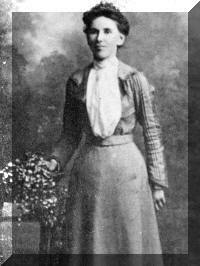 3-Linda May Walker was born on 29 Oct 1878 in Westbury, Tasmania and died on 2 Sep 1965 at age 86. Linda married William Crawford on 2 Nov 1911 in Parkham, Deloraine. William was born on 29 Jun 1860 and died on 15 Jan 1941 at age 80. They had no children. Linda May went as a young teenager to live with relatives at "Green Rises" and with other members of the family living nearby. She married William Crawford, a man much older then herself. Bill as he was known, lived with his father. At his father's death he inherited the farm. He was a good hand with bullocks and used his team to clear much of the farm land in the district. When Bill died, Linda sold the farm and went to live in an old house on Finche's Farm where she nursed her mother until she passed away in February 1942. She then went to keep house for her brother, Thomas. At his death she purchased a house at Deloraine where she lived until she died in 1965.